Sarah Nader - snader@shawmedia.com Cary-Grove's Zach Perrone (left) watches the announcement of the IHSA state playoff pairings Saturday, Oct. 21, 2017 in Cary. Cary-Grove will play St. Ignatius in the first round of the 6A playoffs. Sarah Nader - snader@shawmedia.com Cary-Grove's Addison West (center) watches the announcement of the IHSA state playoff pairings Saturday, Oct. 21, 2017 in Cary. Cary-Grove will play St. Ignatius in the first round of the 6A playoffs. Sarah Nader - snader@shawmedia.com Cary-Grove football players crowd around the television to watch the announcement of the IHSA state playoff pairings Saturday, Oct. 21, 2017 in Cary. Cary-Grove will play St. Ignatius in the first round of the 6A playoffs. 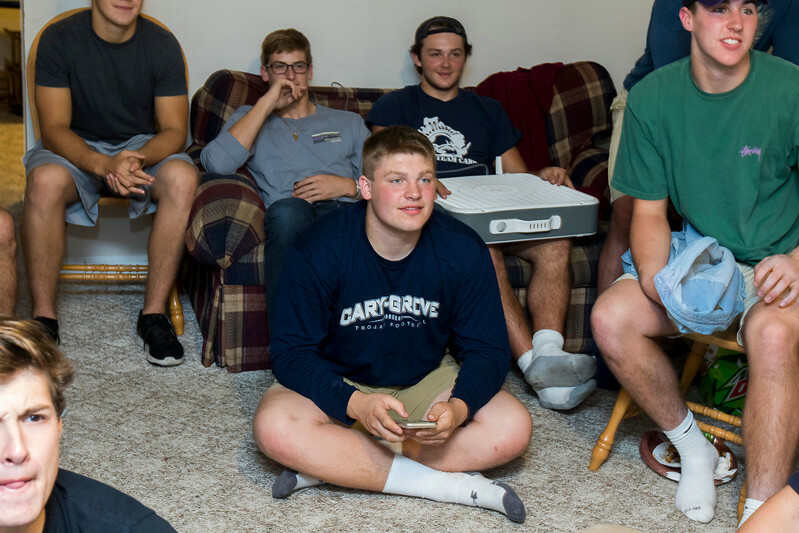 Cary-Grove's Addison West (center) watches the announcement of the IHSA state playoff pairings Saturday, Oct. 21, 2017 in Cary. Cary-Grove will play St. Ignatius in the first round of the 6A playoffs.